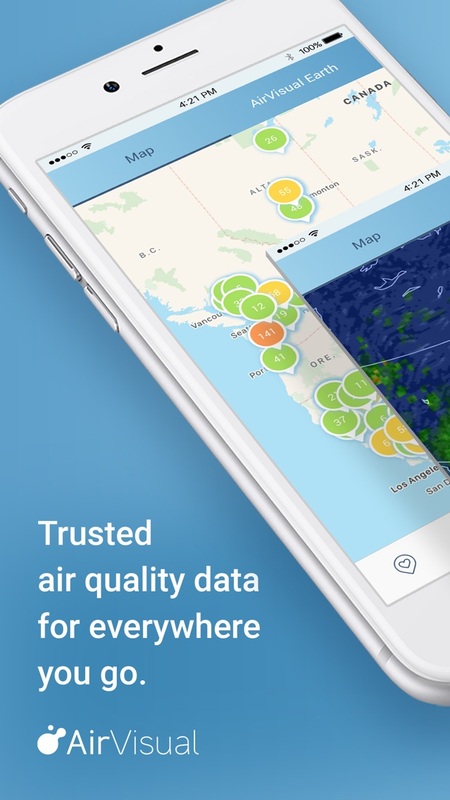 The most trusted and reliable air quality information brought to you from the world’s leading air pollution data provider. Covering 10,000+ locations from a global network of government monitoring stations and AirVisual’s own validated sensors. + Historical, Real-time, and Forecast Air Pollution Data: detailed figures on key pollutants and AQI for over 10,000+ locations in 100+ countries, made clearly understandable. 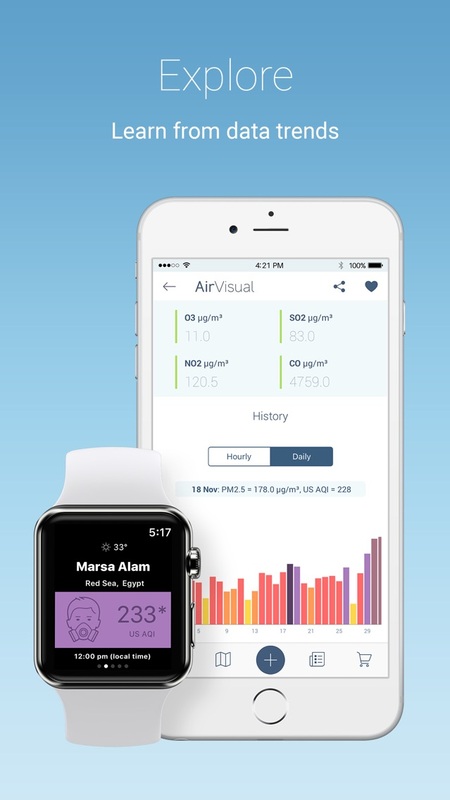 Follow air pollution trends with enhanced month-long and 48h historical views for your favorite locations. 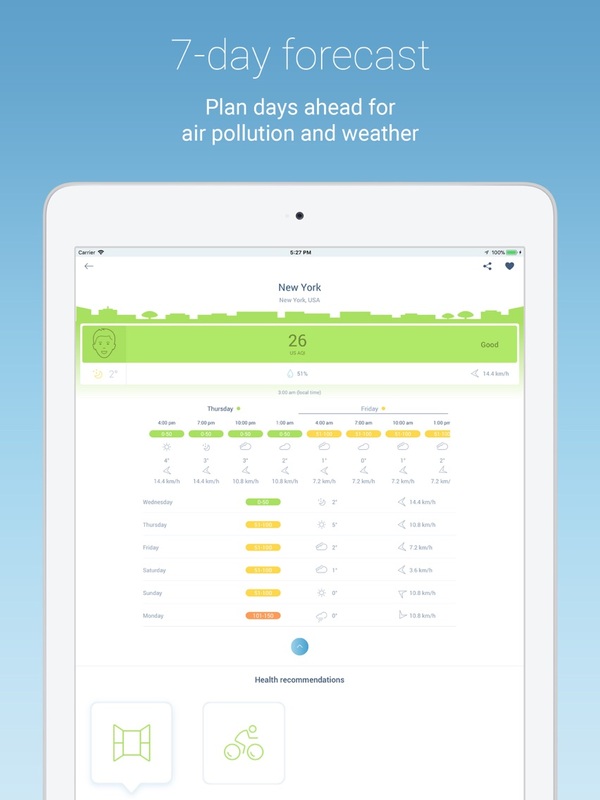 + Leading 7-Day Air Pollution and Weather Forecast: for the first time, plan your outdoor activities for the healthiest experiences a whole week ahead. Wind direction and speed forecasts to understand the wind’s impact on pollution. 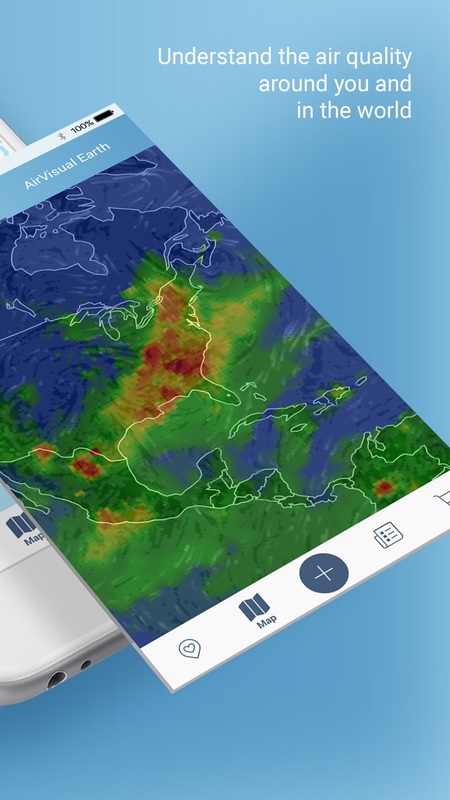 + 2D & 3D World Pollution Maps: explore real-time pollution indexes around the globe, both in a 2D panoramic view, and mesmerizing heatmapped AirVisual Earth 3D modelization.  + Weather Information: your one stop for temperature, humidity, wind, current conditions and forecast weather information. 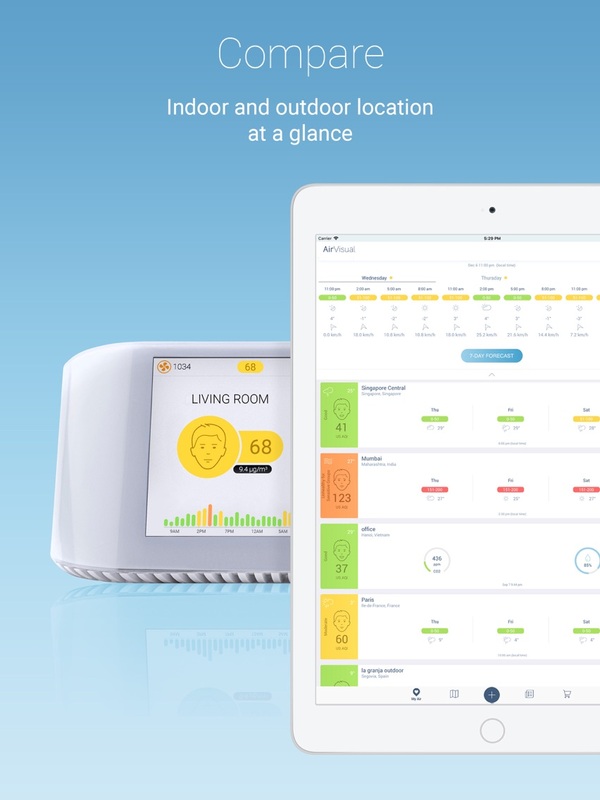 + Indoor Air Quality Monitoring: Synchronization with AirVisual air monitor to provide indoor readings, recommendations, and control monitor settings. 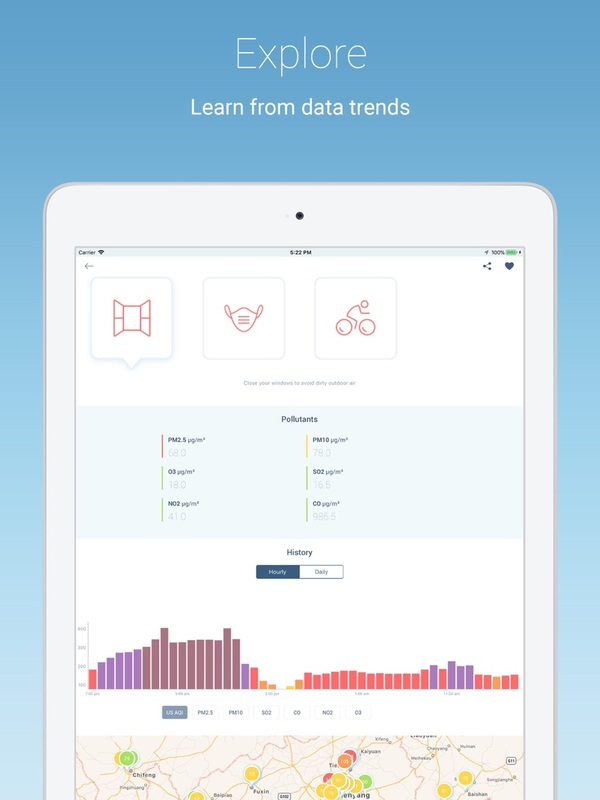 + Realtime and Historic Monitoring of 6 Key Pollutants: track live concentrations of PM2.5, PM10, ozone, nitrogen dioxide, sulphur dioxide and carbon monoxide, and observe these pollutants historical trends. + Extended Historical Data Graphs: view air pollution trends over the past 48 hours, or daily averages over the past month. 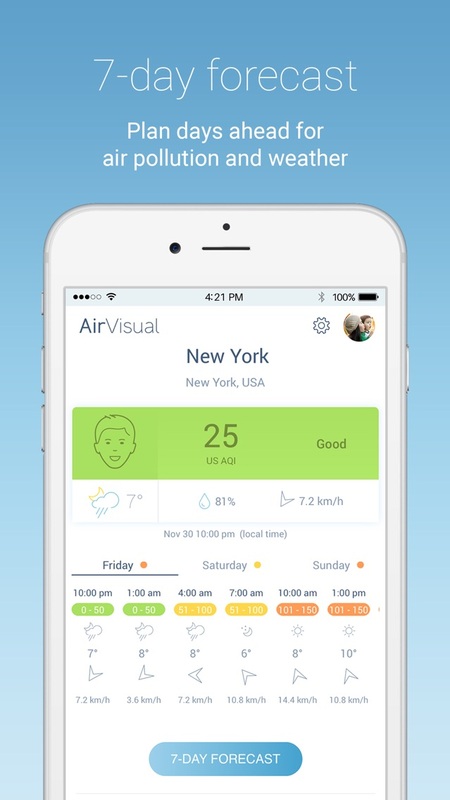 + Share Air Quality Information: screenshot and share with friends via Facebook, Twitter, WeChat, WhatsApp, or email. + Air Pollution Community News: stay up to date on air pollution current events, medical findings and developments in combating global air pollution. + Educational Resources: build your understanding of PM2.5 and other air pollutants and learn how best to live in polluted environments with respiratory (pulmonary) illnesses such as asthma. + Enjoy Interactive Feedback: Have a question? Send us a message and get answers. 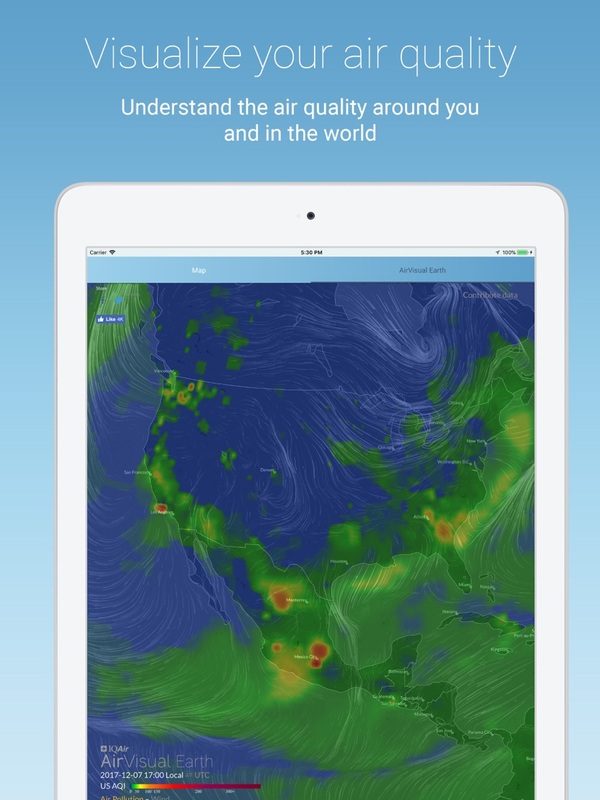 Our in-app forum delivers human interaction between air pollution community members. 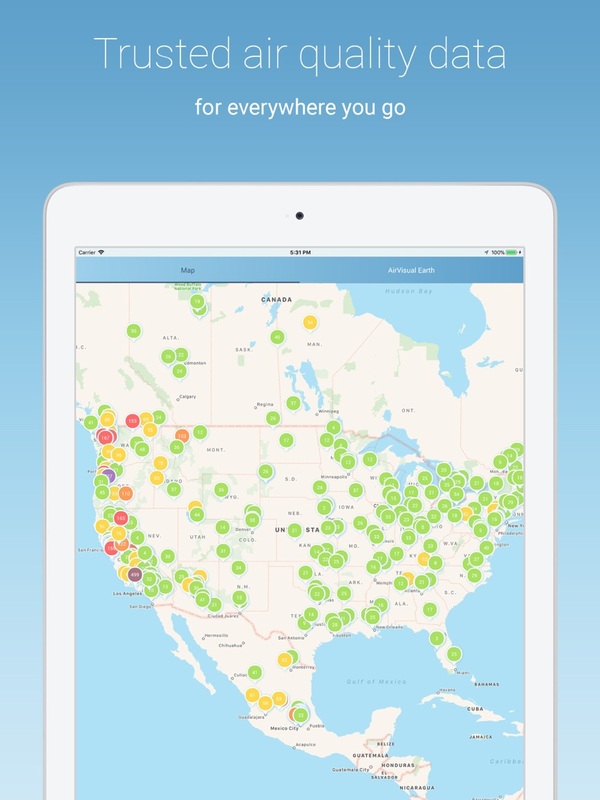 + Trusted Air Quality Stations: access US Embassy & US Consulate readings for China. 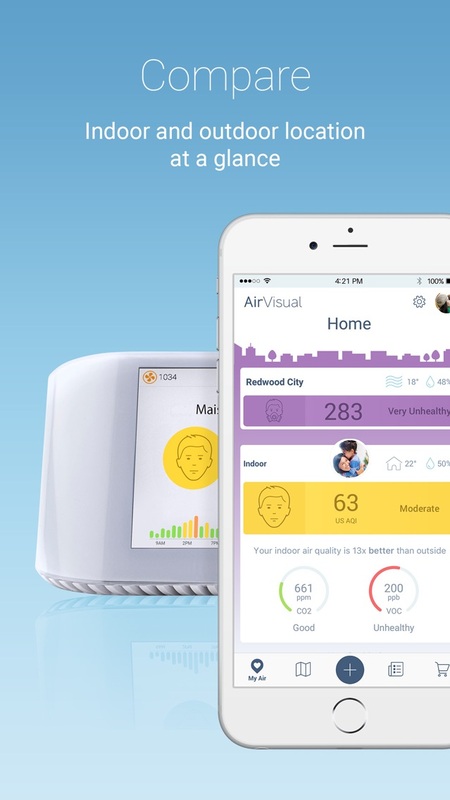 Survive the Airpocalypse in China with trusted data. + World's coverage with the most extensive network of air pollution sensors: monitor China (with US Embassy and consulate AQI), India, Malaysia, Singapore, Japan, Korea, USA, Canada, the UK, Australia, Mexico, Brazil, France, Hong Kong, Thailand, Indonesia, Chile, Turkey, Poland, Peru, the Netherlands, Mongolia + more - as well as cities such as Beijing, Shanghai, Guangzhou, Shenzhen, Seoul, Incheon, Busan, Daegu, Daejong, Mumbai, New Delhi, Tokyo, Mexico City, Bangkok, London, Los Angeles, New York, Lahore, Islamabad, Karachi and 10,000 others - in one place! - Share your air with a picture! New dynamic "nearest station" widget. Weather Puppy: Forecast Radar Weather Creative Inc. Weather Kitty: Forecast & Cats Weather Creative Inc.
طقس العرب – تطبيق الطقس الأول ArabiaWeather Inc.
My Moon Phase Pro - Alerts JRustonApps B.V.
My Moon Phase - Lunar Calendar JRustonApps B.V.
My Tide Times - Tables & Chart JRustonApps B.V.
WKYT FirstAlert Weather Gray Television Group, Inc.